University Park, Pa. — The remote town of Barrow, Alaska, home to more than 4,000 people, touts picturesque views of the Arctic Ocean as well as an unparalleled connection to the Alaskan wild, but underneath its stunning beauty lies a major global crisis — permafrost coastal erosion — causing Barrow to gradually slip into the sea. But all may not be lost, thanks to research funded by a four-year National Science Foundation grant and led by Ming Xiao, associate professor in civil engineering at Penn State. In order to come up with viable solutions, Xiao and his collaborators are looking at the problem systematically. This project aims to bring scientists and researchers from many disciplines together to figure out exactly what the challenges are and identify possible solutions through a series of international workshops, convergent research collaborations and direct interaction with local media. The first segment of the research occurred in Alaska recently. Xiao joined 25 other researchers whose expertise was in social science and natural science disciplines, including coastal geophysics, soil physics, climate modelling, atmospheric science, demography and ecology, as well as disciplines in civil and environmental engineering, for a two-day workshop in Fairbanks. The experts gave presentations and held in-depth brainstorming sessions in order to gain a better understanding of the issues at hand. Then, eight experts, including Xiao, went to Barrow to visit the coastal areas that are in danger. 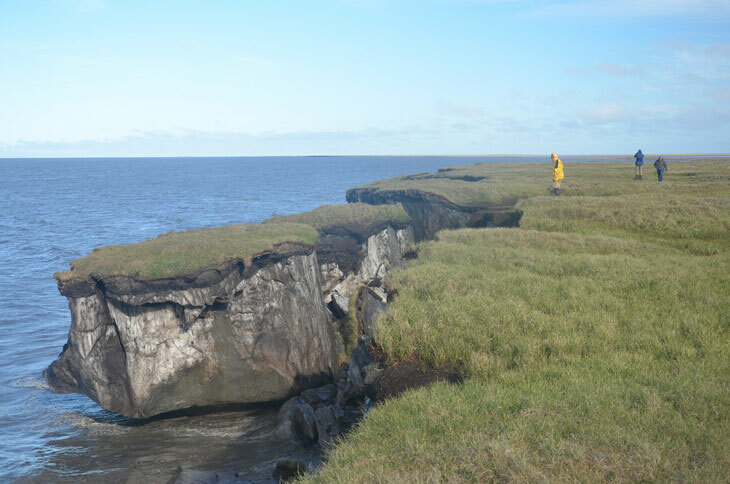 In total, there are 31 Alaskan villages that face an imminent threat from permafrost coastal erosion and will require eventual relocation. The cost, including infrastructure, to move and relocate the people is estimated in the billions, Xiao said, and will cause fundamental disruption to the Iñupiat people’s lifestyle, which has sustained for more than a thousand years. These communities’ livelihood depends on fishing, regularly harvesting walrus, seal, whale and fish for food. Currently, the town’s only defenses against coastal erosion are sandbags and gravel. Though the investigation is still in the early stages, Xiao hopes that eventually the results will provide possible solutions for the town and surrounding areas. Other principal investigators on this project include Benjamin Jones, research assistant professor at University of Alaska, Fairbanks; Vladimir Romanovsky, professor of geophysics at UAF; Kathleen Halvorsen, professor of natural resource policy at Michigan Tech; and Guangqing Chi, associate professor of rural sociology and demography at Penn State.